Three Boars Eatery at 8424 109 Street. A couple weeks ago I went to Thee Boars Eatery on 109 Street and 84 Avenue for the very first time with a few of the ladies from work. The place is not very noticeable from the road – squished in between a row of tall and narrow buildings. I had to swing around twice before I found it. Inside (upstairs) Three Boars Eatery. 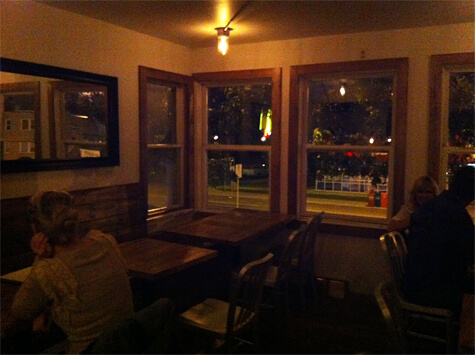 The inside of Three Boars is very small – there’s a bar and a couple tables + patio on the bottom floor, and then a few tables up on the top floor – where we sat. There’s also only one bathroom and it’s also located on the top floor. Menu at Three Boars Eatery. They have pages upon pages of drinks – and one page for food. 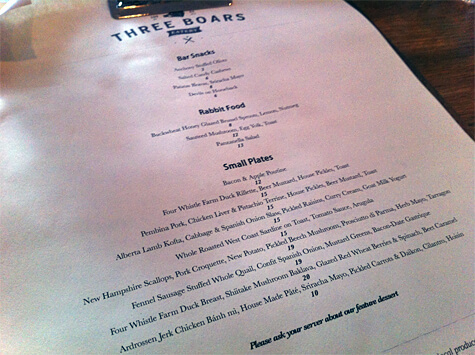 Three Boars says its menu changes “often, sometimes daily” – as the chefs try to use as much local produce as possible (woo hoo!) Most of the food is listed under “Small Plates” – and is very much meant for tapas-esque dining/sharing. I was one of the lasts to arrive for dinner because I worked that Saturday – so the ladies had made the ordering decision by the time I arrived. We would be sharing/sampling a number of dishes and I was fine with that – I was eager to try as much of what Three Boars had to offer as possible! Panzanella Salad at Three Boars Eatery. 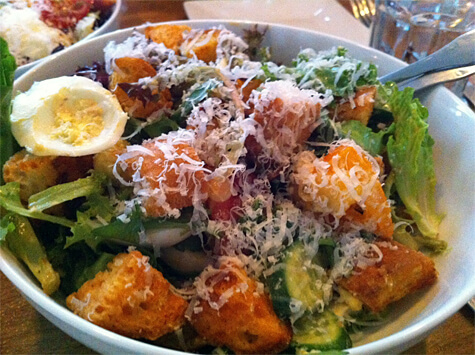 We started off with what I think is the Panzanella Salad ($13). This was ordered before I arrived and I wasn’t 100% sure its title as I gobbled into it but I am making an educated guess. This salad is delicious! The crusty bread was its best feature – along with the egg and the dressing. Great start to the meal! 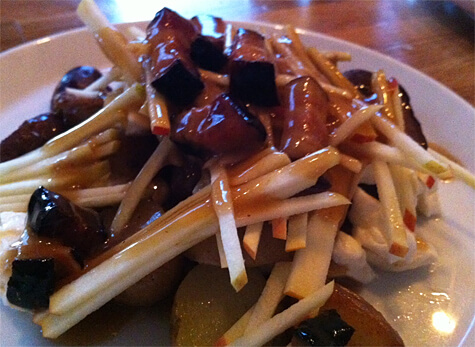 Bacon & Apple Poutine at Three Boars Eatery. Next up was my personal favourite of the evening – the Bacon & Apple Poutine ($12). YUM!! This is one of the tastiest and most unique poutines I’ve ever had. What would be normal cut fries are instead small potato wedges. There are thinly sliced strips of apple, big cheese curds and big chunks of bacon. In my mind, you can never go wrong with bacon anything and this was no exception! I was thinking about the poutine well after the meal was over and into the next day. As I write this I’m tempted to make the drive to pick up some right now! The combination of everything just worked. So. Good. 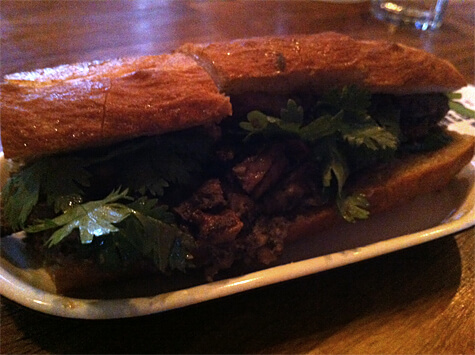 Vietnamese “Banh Mi” sandwich featuring Ardrossen Jerk Chicken, House-made Pate, Sriracha Mayo, Pickled Carrots & Daikon, Cilantro, Hoisin at Three Boars Eatery. 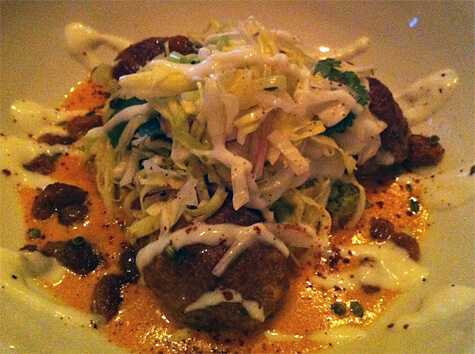 Alberta Lamb Kofta, Cabbage & Spinach Onion Slaw, Pickled Raisins, Curry Cream, Goat Milk Yogurt at Three Boars Eatery. Next up was the Alberta Lamb Kofta with Cabbage & Spinach Onion Slaw, Pickled Raisins, Curry Cream, and Goat Milk Yogurt ($15). This dish was excellent. From the meat to the cream to the slaw – it was a party for my tastebuds. My only complaint? The dish comes with just three lamb kofta balls and they were pretty small. Had I not been sharing multiple platters with friends and had just ordered this as my main dish at $15 – I would have been very disappointed even if it was delicious! It’s just not enough to fill up one person. Not a lot of bang for your buck with this dish. 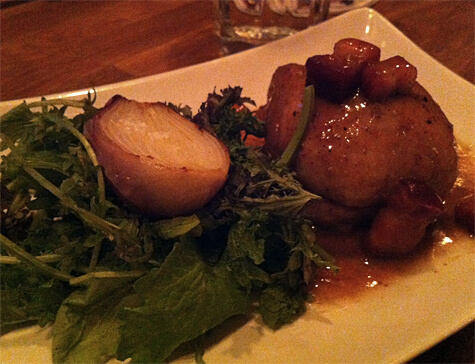 Fennel Sausage-stuffed Whole Quail, Confit Spanish Onion, Mustard Greens, Bacon-date Gastrique at Three Boars Eatery. The last entree-esque dish we shared was the Fennel Sausage-stuffed Whole Quail, Confit Spanish Onion, Mustard Greens with Bacon-date Gastrique ($19). Being the most expensive dish of the night it was also my least favourite. I think I’m just not a fan of the taste of quail. It’s just not up to par with chicken, beef or pork (my main staple meats, lol). As I’m awful at describing how food tastes (still need to work on that, lol) I will just say this wouldn’t be worth $19 – and like the previous lamb kofta, it’s REALLY not worth the money if you care about portion-size. Dessert at Three Boars Eatery. Lastly we all decided to share one plate of dessert. I can’t remember what exactly this dish is called or how much it cost – it wasn’t listed on the menu, you have to ask your server for dessert options but this was some kind of blueberry, granola-y, ice cream concoction that was awful. It was definitely lacking a LOT of sugar. It was one of the most unsatisfying desserts I’ve had in awhile. 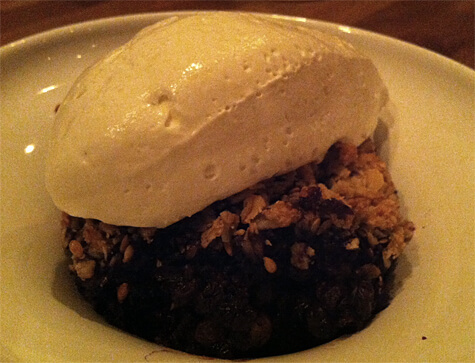 I’m not really a dessert-person to begin with because I don’t really like sweets – but this needed to be sweeter. I’m sure it was quite healthy for you though, if you like that stuff, lol. 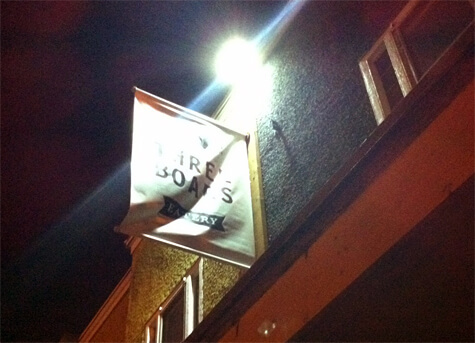 I had a great time at Three Boars Eatery! It’s definitely a bit pricer for a bit smaller of portions than I normally prefer – but I had a really lovely time and my stomach was just stuffed. The highlight for me was the Bacon & Apple Poutine – I’d go back to the restaurant for that alone. Lowlight? The expensive teeny quail and costly lamb dish that only came with three lamb kofta balls. Just in general the fact that some of the dishes – which are admittedly “small plates” – are exactly that: small. The place is also very dark – (well, obviously if you go at night). But you’ll be sitting in low light (hence my poorly-lit iPhone photos) and in fact the lights above our table flickered – a lot. I think that was part of the mood, lol. The place does give off a slightly cramped feeling (there were people lining up to go to the one bathroom). I love that their menu does change often (so I don’t know if the poutine will even be there next time I stop by) – but it’s like a fun adventure every time you go which is appealing. Overall great food and cool that they switch things up so much but worth the money? Hard to say. For this frugal shopper/eater – probably not worth it. In the end my portion of the bill came out to about $30 including tip (I didn’t order drinks). The other ladies’ bills were closer to $50 each with their drinks. Considering Mike and I typically love it when both of our meals together come out to under/around $30 – you can see how dining at Three Boars isn’t something I’d do often. So have you been to Three Boars?! What did you think?? the food was fantastic when we went but the portion size was a little silly. Under the sharsies i ordered the scallop and croquette, it came with one scallop and one tiny cube of a croquette for $20. it was delicious but for something your supposed to share I was expecting a little bit more. 1) I don’t like the “small plates” concept, specially not when the “small plate” is the same price as an entree in some restaurants. 2) Even if I was OK with the “small plates” concept, supposedly, the idea is that of sharing. However, a lot of times they are not condusive for sharing. Sharing a salad? A sandwich (cut into two pieces for three people?!). I could keep on adding more reasons but I am sure these two says it all! Your old NAIT teacher Chris here… I was thinking of going to the three boars as it looks unique and eclectic.. but I like normal size portions unless I’m there to drink a lot of beer as my main course! Good tips my dear!